With comprehensive knowledge of the industry, we are betrothed in manufacturing and supplying a wide variety of Flat Belt Conveyor. It is a type of conveyor belt in which the moving run is maintaining by flat belt idlers or pulleys. To support a flat belt conveyor basically regulate the tail end pulley or the idler pulley, it is designed by our well talented professionals with adjuster bolt to adjust it in order to line up the conveyor. This product is used in a variety of material handing applications, including food and beverage processing, manufacturing and mining. Our manufactured array of this conveyor belt is appropriate for handling cartons, bags, sorting and picking component range, filing, labeling, examination, packaging and wrapping tasks. 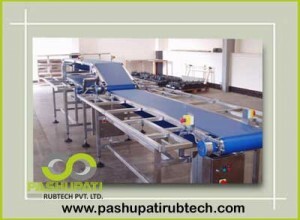 Also this flat belt conveyor system find their application in various industries such as auto component assembly, packaging & warehousing, food processing, wiring harness, electronic products assembly, etc. Moreover, our respected clients can get this range from us at very economical prices. Our offered flat belt conveyor is perfectly designed and engineered under the leadership of our professionals using high quality raw material that are procured from legitimate dealers of the market and utilizing advanced technologies. This belt conveyor is strongly and powerfully builds and is widely used for gathering line operations, testing, sorting, inspections and packing. In order to meet the requirements of our esteemed customers, we manufacture this conveyor belt as per their specifications given by them. This belt conveyor is customized available in different sizes, shapes and dimensions at our manufacturing unit and helps in reducing damage to operators at their workplace.